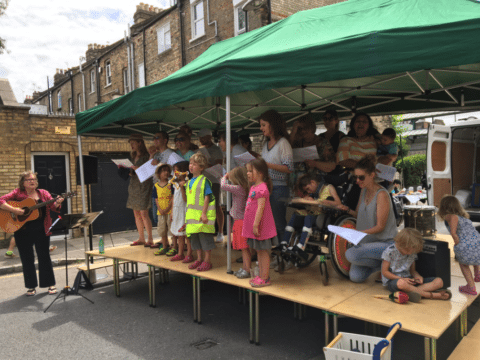 Nag’s Head Choir is a community choir for the Nag’s Head area of London (Holloway N7) that started in Feb 2017. It is open to all ages and all singing abilities. We successfully achieved our initial aim of performing at the Mayton Street Festival in July 2017 with a group of over 20 people of mixed age and ability, including those with learning difficulties. The choir meets on early Tuesday evenings during school terms. The session is long enough for lively warm ups, followed by learning or rehearsing two or three songs, and short enough to enable the smaller children to stay reasonably focused. All songs are taught by ear and include pop, folk and show songs. Singers are also welcome to suggest songs to sing. Contact Angela Reith for dates and other details.